From traditional silhouettes to modern details, we've rounded up the best in Flatware. Get inspired by these table designs for your registry! 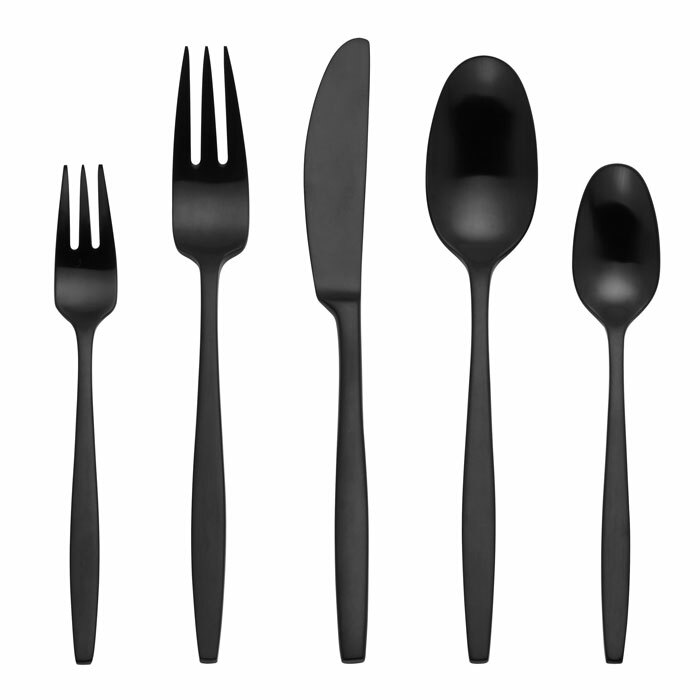 Dansk updates the classic Variation V flatware pattern designed by Jens Quistgaard in 1962 with a striking matte black finish. Crafted in 18/10 stainless steel. Dishwasher safe. High-quality stainless steel that never needs polishing surrounding multicolored epoxy inlays; durable and dishwasher safe. The perfect complement for any semiformal setting, strong enough for everyday use, with a limited 25-year warranty. A textured woodgrain effect adds to the crafted look and feel of this stainless flatware pattern. Durably engineered to provide years of everyday use. Dishwasher safe. With stepped detailing at the base and tip of each well-balanced handle, Nash brings a handsome, traditional feel to any modern table setting. Available at Macy’s. Sommers is a perfect combination of classic shape meets modern styling. The clean fluid design offers a modernist appeal with beveled edges at the base of the handle. Available in a highly reflective mirror finish or a smooth satin finish, both shown here. Available at Bed Bath & Beyond. Thayer features an intricate beaded rim accentuated by a beadblast center panel. Classic design elements make this pattern ideal for traditional tastes. Available at Bed Bath & Beyond. Timeless simplicity and a brilliant mirror finish define this versatile pattern. Almena is classically beautiful with modern appeal. Available at Bed Bath & Beyond. Architecturally inspired Beddington features generous handles and classic, oxidized detailing at the base of the fully mirrored handle. Available at Macy’s. A timeless pattern featuring a delicate beaded design on a traditional fiddleback silhouette. The gentle scrollwork at the base of the handle combined with a high gloss mirror finish makes Cape Elizabeth an attractive addition to any classic table setting. Available at Macy’s. This sculptural design boasts modern allure with a beadblast panel centered between classic fluted edges, adding a polished texture to each piece. Available at Bed Bath & Beyond. Sleek and simply styled, Hamlin boasts modern allure with a dramatic flair, lending timeless appeal to every table. Available at Bed Bath & Beyond. A versatile, brushed design for everyday dining, Satin Torrington lends timeless appeal to every table. The simple ornamentation at the base of the handle is the definition of understated elegance. Available at Macy’s. Clean, forged silhouettes and contoured handles in a gleaming mirror finish lend a chic yet simple sophistication to any table. Available at Macy’s.